Usually when you open a pizza box that's been sitting on your kitchen counter for weeks, you're not going to find a fresh, hot slice inside. So maybe it's time to take your local pizza place off your speed dial and start making your own using this compact oven that looks like a pizza box, except that it's not made of cardboard. 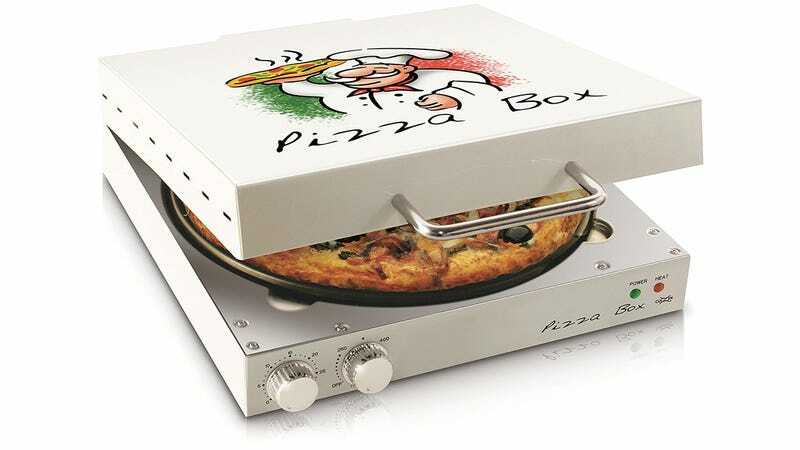 CuiZen's Pizza Box Oven is instead made of stainless steel with a 1200-watt heating element on the top and bottom so it can properly cook a 12-inch pizza. To ensure an even finish the pizza is slowly rotated as it's heated, and a pair of dials on the front lets users set a timer up to 30-minutes long, and a temperature as hot as 525 degrees Fahrenheit. At $60 it's not as cheap as getting a pepperoni pie delivered, but this is one of those 'pay for itself over time' deals.